1 October 1937: Adjutant of the III Army Corps. 26 August 1939-25 June 1941: Operations Officer (Ia) of the Deputy III Army Corps (Wehrkreis III), Berlin. 23 October 1944-1 November 1944: Commander of the 462nd Volksgrenadier Division. 1 November 1944-April 1945: Division Staff for Special Employment 469 (also known as Division Nr. 469). 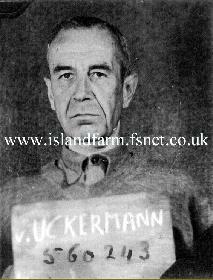 11 April 1945-25th November 1947: Prisoner of war in British captivity. NOTE: Freiherr von Uckermann’s World War II decorations, if any, are not known. However, he was not a recipient of any high decorations such as the Knight's Cross of the Iron Cross, Knight's Cross of the War Merit Cross with Swords, or the German Cross in Gold/Silver. It is probable he received the 1939 Bars to his World War I Prussian Iron Crosses.